Busker’s Christmas Carol: Miser Beware! 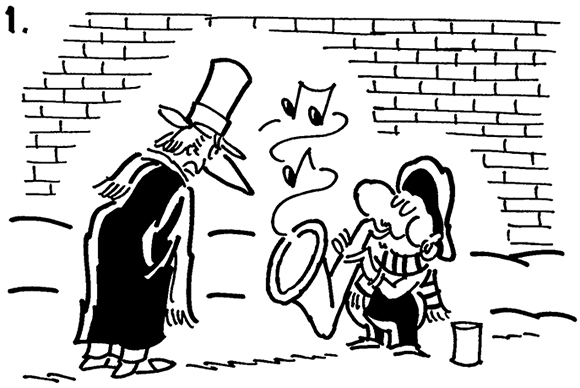 As mentioned in this prior post, I used to do a weekly strip about a street musician named Busker. I thought you might enjoy this one from December, 1996, inspired by Charles Dickens’ A Christmas Carol. Busker dates back to my pre-computer days. 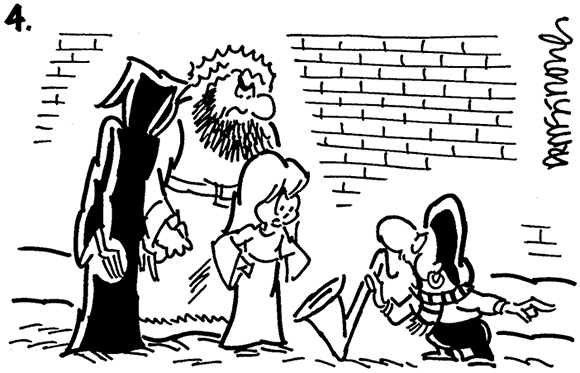 The strip was always published as a large single panel with two rows. Here’s the original in all it’s hand-drawn, hand-lettered glory. Merry Christmas to all my friends, followers, visitors, and fellow bloggers!! What do you think? Have you read Dickens’ original story? Will you be more likely to toss a coin to a busker after reading this post?? Hope you’ll leave a comment. Downtown Office Building Swallowed By Nativity Scene!! Nice vibe one A Christmas Carol, Mark. I like Buskers responce to old Scroogey!! Thank’ee, mate! Yeah, Busker don’t take no humbug from nobody, see?? He’s like that Murray chap: My hammer, s’il vous plaît– SLAM, BANG, PULP-aroonie!! Happy Christmas my friend! No misers allowed here either! woo woo! I do like it Mark! This is the first year I watched Scrooge in it’s entirety, both the one with George C Scott and the one with Patrick Stewart and actually enjoyed them. When I was younger, the whole story always scared me, not because of the ghosts but because he was so alone and mean. Guess I’m grown up enough now to really get the gist of the story and enjoy:-) Loved your artwork, especially when the three ghosts show up and Busker is giving them the low down! Thanks, Tracey! Hope you had a blessed and very merry Christmas. And since it’s New Year’s Eve Day, I’m wishing you a Tremendous year ahead, filled with much happiness and success!! 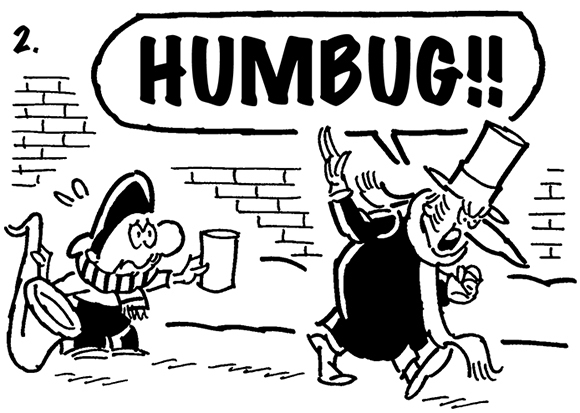 FWIW: Dickens’ A Christmas Carol has always been a favorite of mine– I used to read it every year. My favorite movie version is Scrooge (1951), filmed in England with an all-British cast. The movie tweaks the book very slightly, filling in a few “holes,” but it’s done so subtly and discreetly, you’d swear they filmed the book verbatim. They don’t come much meaner than Alistair Sim as Scrooge, so brace yourself if you ever give it a try!! 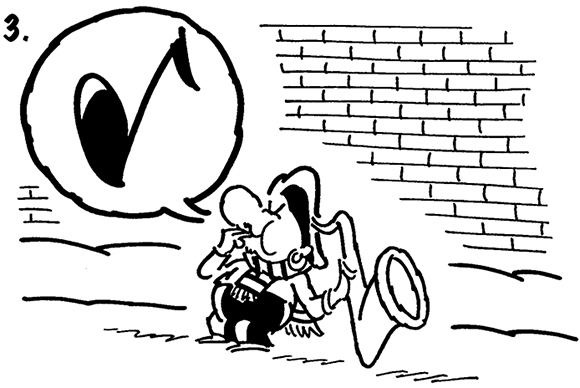 Scrooge has no ear for music. But I ‘ear ya loud and clear. Hope you and your family had a very Merry Christmas, and that you’ll have a prosperous and bright Happy New Year, Mark. So, Mark, your tribute gave me a warm, fuzzy glow and a nostalgic look back at my old stomping grounds. “… all their glory…” I love it! It’s kind, it’s wunnerful, it’s totally outrageous– and I’m lovin’ it here!! Thank you, dear Sabine! !